Pink gingham jersey knit makes up this cute tunic top trimmed in pink heart trim. Velcro closure in back. White cotton shorts are knee length and have elastic waist casing. Made to fit 18" Girl Dolls such as Madame Alexander, My Twinn, American Girl and Magic Attic. Shown on Madame Alexander. Doll, stand and shoes not included. 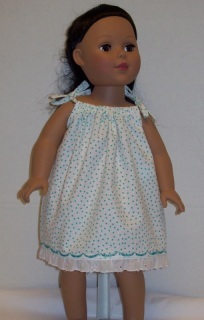 White cotton with turquoise print makes up this darling sundress with self fabric shoulder ties, eyelet lace trim on hem and machine embroidery in turquoise thread. Made to fit 18" Girl Dolls such as Madame Alexander, Magic Attic, America Girl and My Twinn. 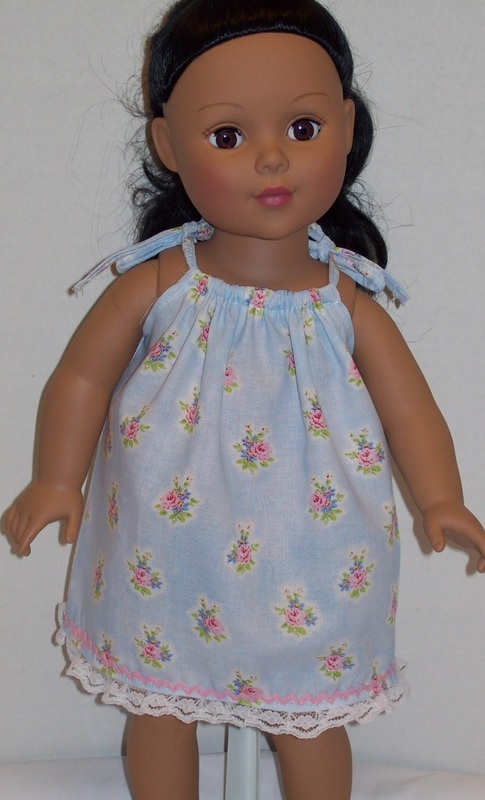 Light blue floral cotton print makes up this darling sundress for 18" girl dolls. Dress has self fabric shoulder ties, white polyester lace trim on hem and tiny pink rick-rack on hem. 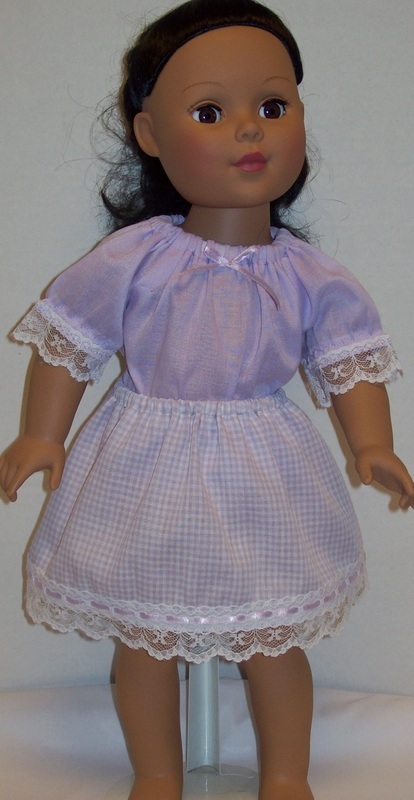 Purple cotton in solid and gingham print makes up this cute skirt set for 18" Girl Dolls. Peasant style top has lace trim on sleeves and elastic casing in neckline and sleeves. Ribbon bow at front neckline. Coordinating gingham skirt has elastic waist casing with matching lace trim at hem.